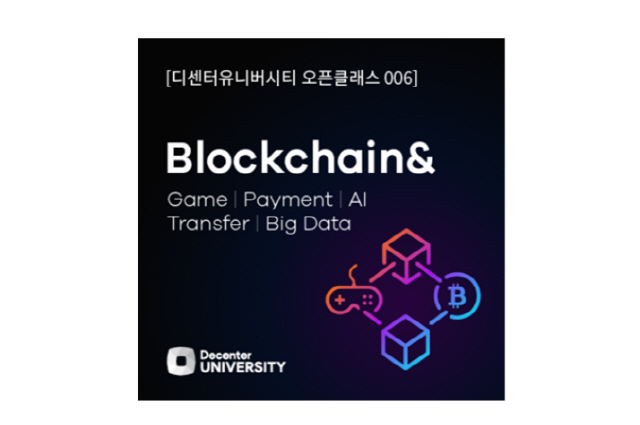 Blockchain game industrialists concurred on this on the first day of the “Blockchain & Week, If Blockchain Meets Other Industries” organized by Decenter University for three days beginning Tuesday. The game industry is one of industries that could generate greater synergy if combined with blockchain. That’s because it’s possible to tackle the most serious problem involving existing game companies: “game companies’ item management and their chances of manipulation.” Blockchain technology could make it possible to have peer-to-peer game item and crypto asset transactions without going through game companies. 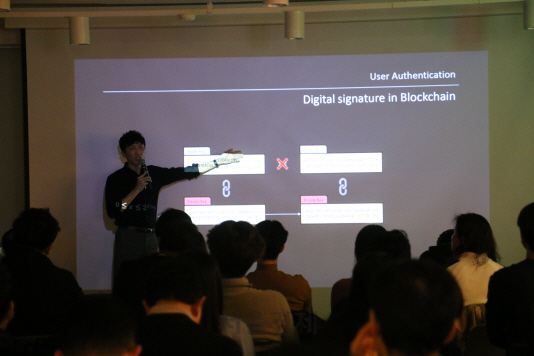 Industrialists who attended the “Blockchain & Game” event said the blockchain-game synergy would grow bigger although there is much to be desired like data processing volume and user interface (UI) and user experience (UX) because blockchain is still in its infancy. Independent game developers and other smaller firms would capitalize on blockchain to build a more abundant ecosystem. There must be limitations, given the infancy of the relevant industry. Many obstacles await ordinary game users who are ignorant of technology in playing blockchain games. “Users have to go through somewhat complicated and difficult sign-up procedures to play blockchain games. 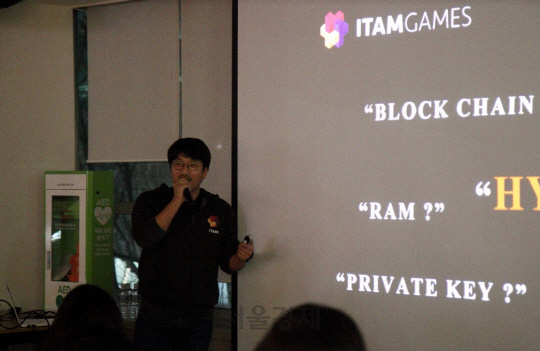 As far as EOS-based games are concerned, users need 1 EOS (about 4,500 won) just for subscription and have to keep their private keys well even after signing up for the relevant games,” Gill said. Ordinary game users have to understand the blockchain system to enjoy blockchain games. Unlike online games where the login is possible just with the input of ID and password, blockchain games require users to be familiar with public and private keys and how to use the cryptocurrency wallet. “It’s true technical details needed to enjoy blockchain games are hard for ordinary gamers to figure out. Such hurdles as autograph transactions that appear repeatedly in the course of gaming will also lower users’ immersion level,” said Conrad Um, head of the GXC Blockchain Lab. Some insist on autograph transactions although they are inconvenient. That’s because blockchain technology itself pursues a high degree of security. “It’s necessary to look at things from the perspective of the general public. We have to agonize over the level of convenience within the framework of not undermining the value of blockchain,” he said. Would the blockchain game market remain the “league of them (developers)” failing to secure enough users? There are assertions that it’s necessary to look through the industry from the perspective of business. Yet blockchain must not be the end of services. The moment blockchain becomes the end, the pertinent project is doomed to failure. “Positive synergy could be generated by integrating blockchain only after thinking of fun, the most important factor in games, first,” Kim said. 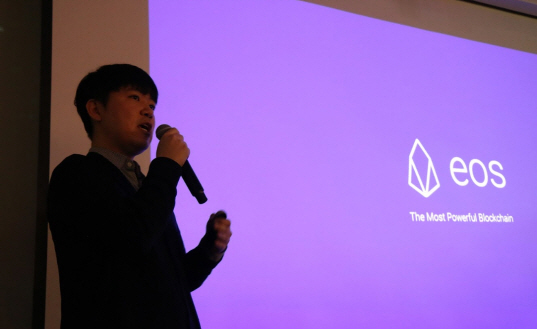 At present, EOSYS is cooperating with various service developers through “JellyJuice,” a joint development platform through which industrialists can upload their services on the EOS blockchain easily. SuperTree is a company looking for a harmonious blockchain innovation. This means that blockchain technology philosophy must be harmonious with user convenience felt by ordinary gamers. “Blockchain enables ordinary companies, not the government, to offer rewards through decentralization. 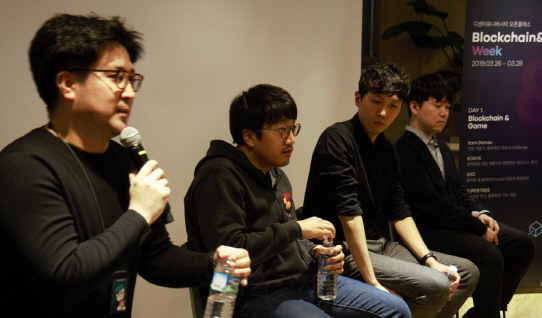 Based on this blockchain technology philosophy, game companies need to agonize over how to attract customers,” said Choi Sung-wone, CEO of SuperTree. What SuperTree opted for is “user first.” Unlike other blockchain games played only via cryptocurrencies, SuperTree exploited such traditional payment methods as PayPal to remove all inconvenient hurdles that could be felt by users. “Users having cryptocurrencies account for only 1% out of 200 to 300 users. SuperTree is front-loading what gamers want to help them enjoy games more conveniently,” Choi said.